Publicity Flyer "The Book Every Aspiring Entrepreneur Needs Right Now"
"where aspiring entrepreneurs seek expert advice"
but because of a new policy in effect 4-30-04 -- these free-to-view pages have gone away. Buy EYSU from Amazon, our publisher PPI, or any bookstore. 3. Wednesday, January 7, 2004 Vol. 30, No. 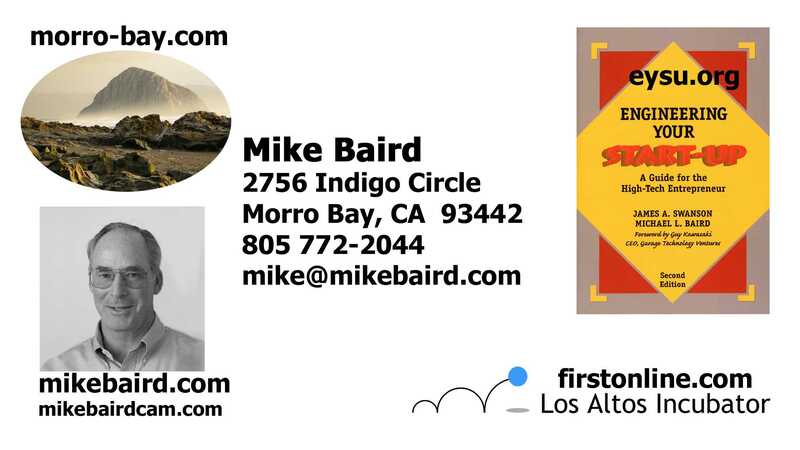 40, P. 5 "Local Section" -- Central Coast Sun Bulletin, An Edition of The Tribune (Morro Bay, CA) "Local man's how-to high tech book is back." 5. Mon. March 22, 2004, 6-8:30 PM Entrepreneuring on the Central Coast: How to Survive and Thrive on a Start-up Team -- SLO Society for Technical Communication.